Sporting events were Dan Deegan’s primary interest in life. His favorite sport was boxing. This story is a little complicated because in the 1890s and early 1900s, professional boxing was illegal in most states. Despite this, the newspapers openly reported on fights. It may have been that amateur bouts were legal. It is surprisingly hard to find specific information about the laws pertaining to the sport. New York State passed the Frawley Act in 1911 which permitted professional boxing until 1917 when a boxer was killed in the ring. The Walker Law passed in 1920, making bouts legal again. 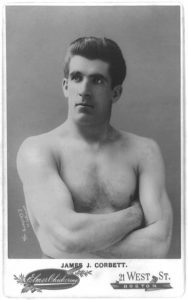 Still, for much of Deegan’s life, big-time boxing was against the law. 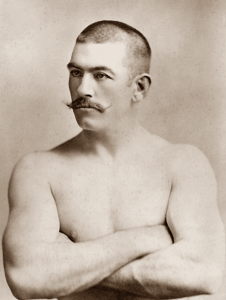 In March 1895, the Advertiser reported that Deegan was hustling to get his new restaurant (the Alhambra) ready for a visit by boxer James J. Corbett. Corbett was perhaps best known for having beaten Sullivan, but he also toured as an actor. He was performing in a play called Gentleman Jack (his nickname) at Geneva’s opera house. The Advertiser observed that though the plot was not deep the play was pleasing. “After the show was out Corbett and some of his men showed up at Dan Deegan’s new resort, and the rooms were packed . . . ” (April 2, 1895). Perhaps “sparring” and “tilting” were words that signaled to the reader that the event was officially amateur, and the fights Deegan arranged may all have been in that category. Gambling, at least in the form of lotteries and casinos, was illegal in New York at this time, but personal bets must have been in a different category. They would have been impossible to regulate, certainly. It seems that Dan Deegan joined that large party which left Carson City on the day after the fight, and went through to San Francisco, where he had a royal time for two or three days . . . he handsomely entertained Corbett when he was here two years ago, and the latter seldom forgets a courtesy of that nature. (Advertiser, March 23, 1897). The ground upon which [Geneva Mayor Patrick O’Malley] takes exception to the fight pictures is that such exhibitions tend to promote criminality by fostering and encouraging a fighting lust among the young people who flock to the moving picture shows. In response to Mayor O’Malley’s objections to the moving pictures of the Johnson-Jeffries fight, Manager Daniel Deegan of the Dreamland Theater has declined to accept a contract for their use in his house (Daily Times July 7, 1910). It seems unlikely that Deegan would have agreed with Miss Miller’s assessment of boxing, but he must have thought this was the prudent course to take. Boxing, though, did not end in 1917. The Daily Times reported in 1919 that “Matchmaker Dan Deegan . . . last night signed the last match for the . . . next show . . . which will be staged at the Smith . . . it looks as if the Geneva fans . . . were to have the benefit of a few personal grudges” (September 24). 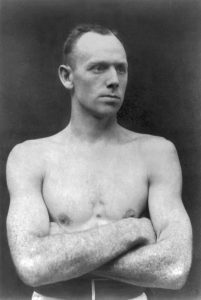 The paper claimed the next month that Deegan considered handling boxers “a Rare and Delightful Pleasure,” but the article following actually featured Dan complaining about the difficulties of putting together a match, and saying that boxers are harder to please than horse racing men and actors (October 4). Deegan retained his old enthusiasm, though, and in 1921 the Times reported him (and many other Genevans) going to Jersey City for the Jack Dempsey-Georges Carpentier fight (June 30). By this time, professional boxing was again legal, and the sport had gained a regulatory commission. Deegan arranged more matches in 1927 (Daily Times, October 26) and was promoting an amateur boxing club in Geneva in 1929 (Times, November 6). The bouts were still taking place at Smith Opera House. The year before he died, Dan was keeping time in a series of local fights (Times, December 28, 1933). In January 1935, James Corbett’s autobiography was given to the Library in Deegan’s memory.